ME: You mean the union? ME: [looking down at the flyer and handing it back to her] You don’t need to go any further because I will not vote for Barack Obama. In fact, I don’t know who I’ll vote for but it ain’t gonna be him, or maybe I won’t vote at all. ME: You wanna know? Write this down in that thingy you got there. I’ve been a Democrat all my life, I voted Democrat ever since I turned 18 and voted for the losers and too few of the winners. I’m well aware of the way primaries and conventions should run, and despite it all, each Democratic presidential nominee in the past 40 years has won the majority of the votes in the party and without fudging th delegates around. My vote, a Hillary Clinton vote, was sliced in 1/2 and discounted in the primaries. Then in late August, my vote was thrown in the toilet AGAIN because the fix was in for Obama to win. My vote did not have a chance to be heard at the convention. Delegates were harassed and bloggers were sent death threats all because they spoke out against the vote fraud which, by the way, your UNION pervasively allowed more voter fraud to be committed in the Nevada caucus. So no, I will not support Barack Obama and I will not support the DNC. Canvasser: Oh, well, ok. [now scared of me and following Obama Camp training manual protocol to disengage target if hostile and armed with a laundry basket] ] Um, will you at least support down the ticket this November? ME: Well somebody has to since Obama took all the DNC state staff away from down ticket Dems to serve him and him only! I’m not happy with Kathy Castor endorsing Obama right after our primaries in February but she’s done some good local work in helping foreclosed families keep their homes, something that your candidate hasn’t done amongst a galaxy of things he has yet to accomplish other than blather about himself. The DNC stole votes and delegates away from Hillary to push him ahead. Now how the hell you expect me to support THAT? Look, I’m sorry if I’m being rude, but you asked me how I felt and that’s how I feel. ME: How do you expect us to trust him when he and the DNC stole votes to win? Anyway, you need to get to the end of this block before Christmas so I’ll stop talking now. It ended with a cordial thank you and goodbye. Rico’s got a “whateva ya want” 2-4-1 special since we’re all broke. Flo’s mad her 401K at her day job keeping going down and her broker doesn’t answer her calls. Broker will soon be “broken” if Flo doesn’t get answers quick! She’s also on the lookout for troll derivatives that sub-prime the comments. Late Night: Now for something completely different…. Okay, so I put up a very depressing tinfoil tinged post. So sorry Conflucians. I didn’t mean to cause upset tummies or sleepless nights. So as penance, here are a few cheerful tidbits. An analysis carried out by a language monitoring service said Friday that Gov. Sarah Palin spoke at a more than ninth-grade level and Sen. Joseph Biden spoke at a nearly eighth-grade level in Thursday night’s debate between the vice presidential candidates. Sentences per paragraph: statistically tied at 2.7 for Biden and 2.6 for Palin. Letters per word: tied at 4.4. 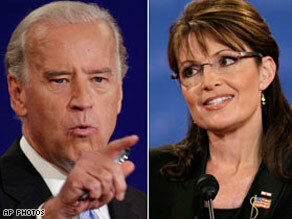 Ease of reading: Biden, 66.7 (with 100 being the easiest to read or hear), versus 62.4 for Palin. The analysis said Abraham Lincoln spoke at an 11th-grade level during his seven debates in 1858 against incumbent Stephen A. Douglas in their race for a Senate seat from Illinois.